About three weeks ago I euphorically wrote about Google Wave, had a Wave embedded in the blog post, got a lot of comments, … and did many things with Wave in the meantime. Since then I also have started a list with my humble suggestions for improvement of the user experience. Let me give you a quick update on my personal Wave experience. Wave has already become a sort of everyday tool for me. My firefox plugin shows the number of unread messages in the inbox and the number of people I communicate with is on the rise. We even use the ties from Wave into Google Groups to create private Waves with restricted access. Therefore, with a small circle of partners and friends Wave has partially replaced email for some communication needs. Never having been fond of walkie-talkie style instant messaging or chat conversation or Twitter the feature of instantaneous, collaborative, style of communication is certainly a great one. And Wave crushes it. We nailed communication which would have taken much more effort and time for accomplishing the same results via email, chat, skype or phone. The concept of hosted conversations with synchronous access for working collaboratively is just brilliant. The real power comes from the combination of — the removal of the barrier between — synchronous and asynchronous collaboration in one tool, one document. Sure, right now in the beta preview there are clearly visible limits on performance. Waves with 50+ participants and 100+ blips (A blip is similar to a reply, a comment.) load very slowly sometimes. Especially when gadgets (or a lot of gadgets) are involved. The browser often crashes or Wave resets itself. Despite all those disturbing annoyances I never lost any significant amount of data. Not more than half a sentence at most. That's certainly a new paradigm. I got very quickly used to the fact that you do not need to think about saving a document at all. You type it and it is basically saved in that very same moment. Have the Session Manager Add-on installed. (↑) After a browser crash you can resume very quickly exactly where you left of. The Google Wave Notifier Add-on for Firefox (↑) displays the number of unread waves in your inbox. His personal suggestion was, “…remove additional parameters like &hl=en from the URL of a search.” Matt simply likes to send URLs of searches by email. Where is the opening tag for this formating? And where is the closing tag? It might not be obvious but those tags — comparable to those in HTML — exist. Unfortunately I did not come across an editor yet which shows those tags optionally. I always end up deleting one of those invisible control characters (tags) with the delete key, backspace key or cutting with the mouse when editing text in rich text format. Which results in destroying the formating of the current, previous or following line. Honestly, I did not figure RTF out, yet. Admittedly as comfortable and quick as it is to copy & paste complete blog posts with ease and drag photos and graphics into a wave, I still wish there were a plain text input mode available optionally. Right now with Wave you don't really have a choice, right now. It's editor is a WYSISYG editor. Well, of course you have the choice and you may stick with clear text and simply don't use any formatting at all. But that's not really the point, and it is not so much fun either. P.S. : When will I see you on \/\/ave? Posted by John W. Furst in Google Wave, Marketing, Project Management, Usability, Web Site Development on Sunday, December 6, 2009 has got 3 Comments. 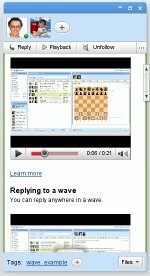 This post was mentioned on Reddit by elandria: Google Wave already used productively by some people. I am working in marketing in Denmark and was searching for inspiration in the digital world.